Everyone needs a great looking outfit for Winter Sports ……skiing, snowboarding, sledding, skating or just being a spectator. Consider creating your own official sports or team theme. Use color and design of fabric, embroider a logo, or use HTV (heat transfer vinyl) to embellish. The limit is your imagination. Winter fun never looked so great! This pattern is authentic in features (with a few doll size tweaks) so your gal or guy will always look stylish and trendy. 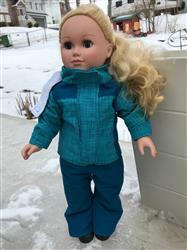 The jacket is fully lined, has a high collar with full front zipper and outer placket, a detachable hood, and cuff tabs for tightening at the wrists. 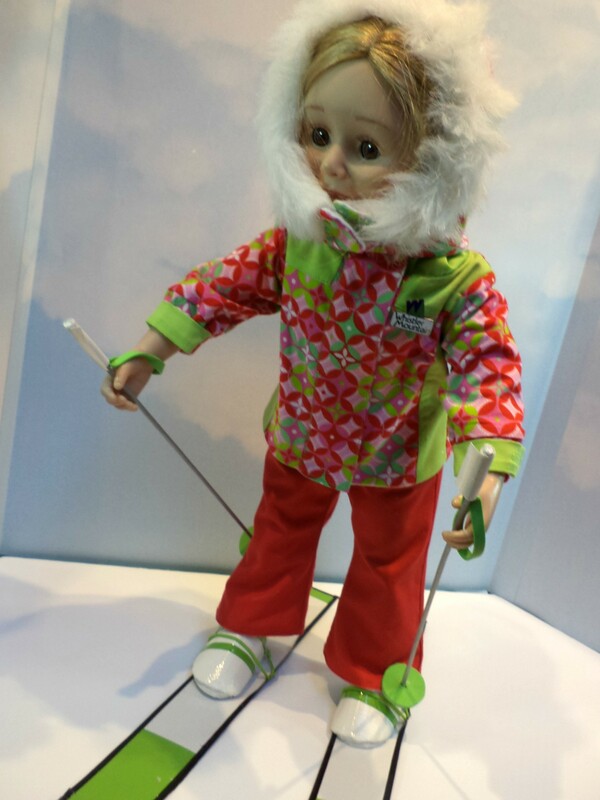 Pants are fully lined one piece with hook and loop tape closure at shoulders, wide legs for fitting over ski or bigger bulky boots and can be made with or without a zipper front. 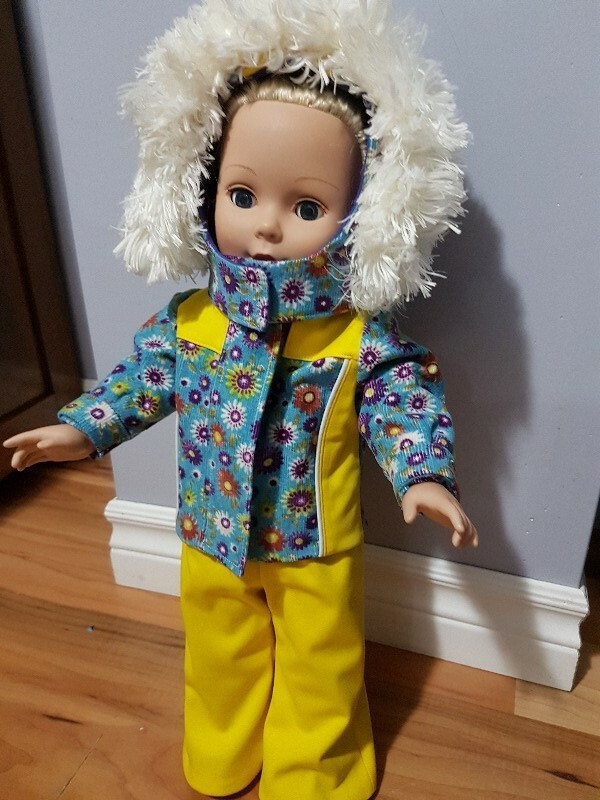 The suggested fabric for outfit is quilter’s cotton which has many doll size prints to choose from and is a delight to sew with but any woven fabric similar in texture and hand may also give nice results. Lined with cotton flannel, found in so many great solid colors, adds just the right “fluff” for lining with an authentic bulk look. Just be sure to wash/preshrink flannel before using. 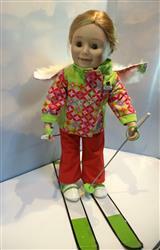 Techniques include easy steps for applying zippers, how to bag line the jacket and pants. Especially helpful is the technique used to join the pant leg lining to the outer pant legs so you don’t have to hand hem at end of construction. Take the pattern a little further by creating an astronaut space suit, as shown in one of the example images. ● 1/4 Yard or scrapes of contrasting fabric for shoulder/side appliques. Otherwise use same fabric chosen for pants as contrasting fabric. ● This supply will make steps go much easier, be sure to acquire. ● Tape is so fine it will not interfere or bulk after sewn into project, there is no need to remove it unless it is not hidden in seam allowance and that will be indicated in pattern steps if necessary. What You Get: One 71 page sewing pattern that you digitally download as a PDF file so you can start your project immediately! The PDF sewing pattern provides full color step-by-step illustrated instructions and full size pattern pieces. This pattern contains a 10 page Summary of Instructions to help save on printer ink. A PDF reader is required to view and print the files (example: Adobe Reader or Preview for MAC). The download link is received immediately after the transaction is complete. Print copies are NOT available. 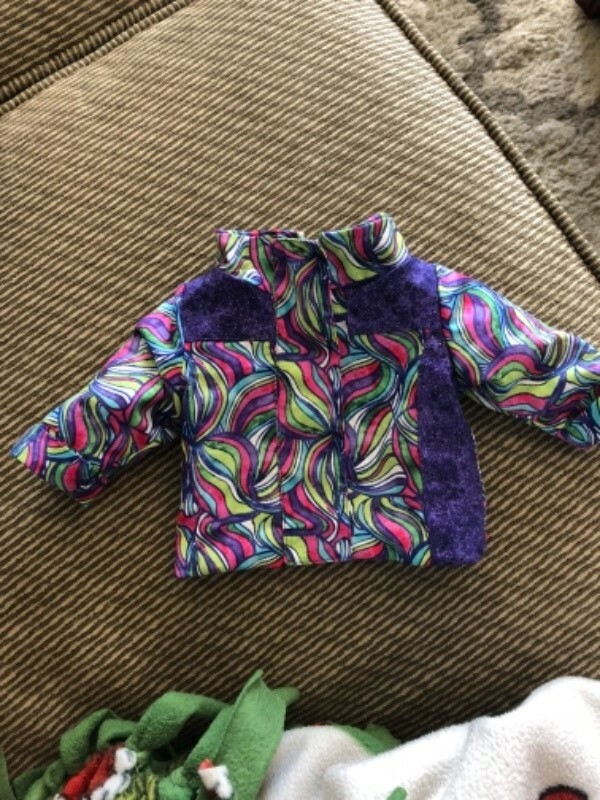 This is the first pattern I've purchased for doll clothing and I was a little daunted to begin with. The pattern is styled more like a tutorial in that each step is carefully explained and photos are added for clarification In reading the steps for hemming the ski pants, I had no idea how they would turn out. But I followed the perfectly written directions and voila, they were hemmed. 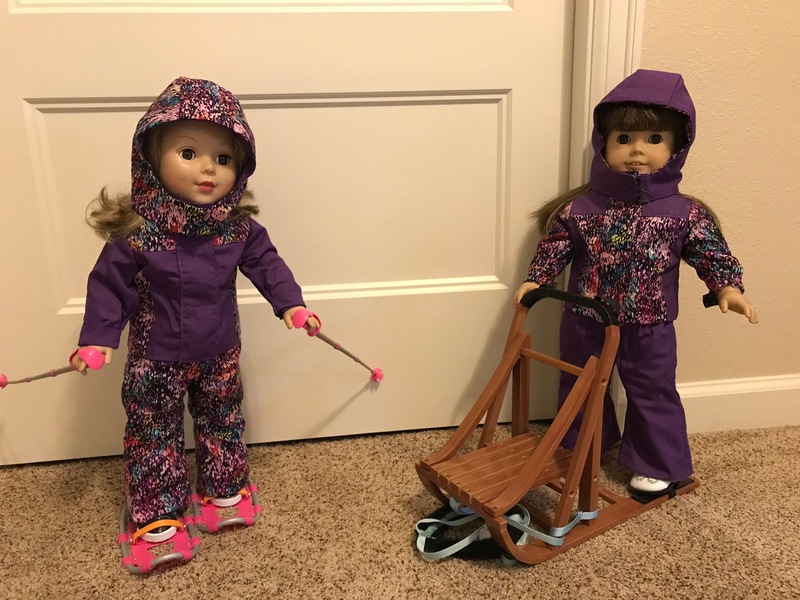 The detail in the finished jacket and ski pants makes the pattern an excellent buy even at twice the price. I would definitely buy from this designer again. My daughter (and her beloved Abigail) love the finished product! This pattern was exactly what I was looking for to make for my Granddaughter for Christmas. It was very enjoyable to make and I love the realistic details. My Granddaughter was delighted with the outfit and is looking forward to her American Girl doll wearing the outfit when she takes her with her on a skiing holiday. I was tempted to only give this pattern a 4 star rating but the results are so spectacular I resorted back to 5 stars. Although the finished outfit is awesome I did find the directions challenging in places. It took a bit to figure a few things out and some I had to resort to doing my way. 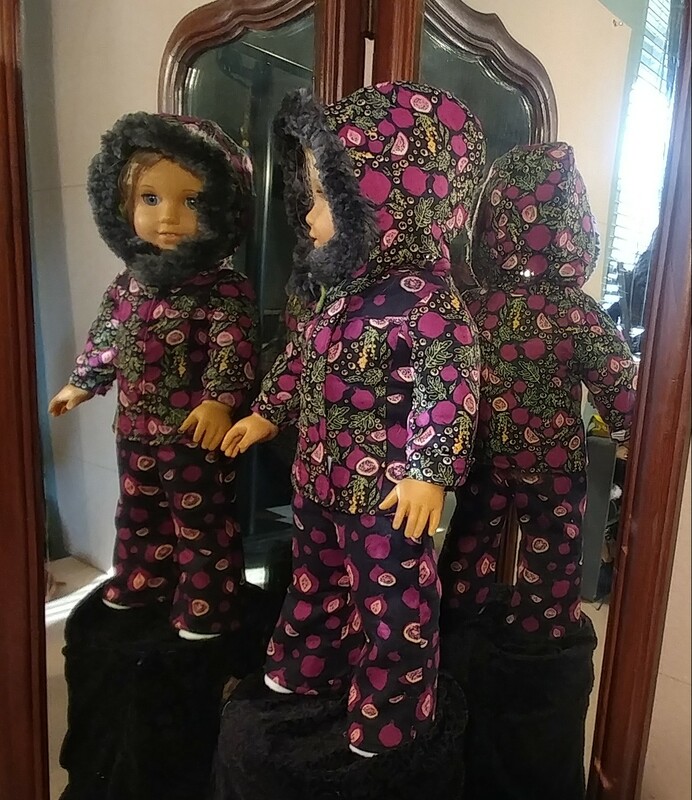 Sweet parka and snow pants pattern. Love it. This pattern was quite challenging for me, but probably because I'm relatively inexperienced with a lot of techniques. I managed to finish the outfit and it turned out beautifully! Now that I've done one, I want to do more. It is a great pattern with lots of details.